Thanks to Buddy-to-Buddy volunteer Turnera Croom, an ailing veteran is now getting the care he needs. The veteran was paired with Turnera after calling the program and requesting help. Turnera reached out to him immediately, spoke with him over the phone a few times, and eventually met with him in person. He told her about how he was experiencing a lot of pain and difficulty sleeping. These serious health issues had driven him to express suicidal thoughts. Though he was eligible to receive care from the VA, he hadn’t done so because he was afraid of going to a VA hospital. Knowing how critical this veteran’s needs were, Turnera stayed in close contact with Buddy-to-Buddy staff to receive guidance on how to assist the veteran and provide ongoing support to make sure he was safe. Turnera’s persistence and tenacity are paying off. As a trained B2B volunteer, she says she thinks of herself as a “friend with resources,” and she made a big difference in the veteran’s life by building his trust to a point where he was comfortable seeking medical care with her encouragement. The veteran is now receiving ongoing care from the VA and is on the road to gaining better health, mentally and physically. Turnera has been a volunteer since December 2017. 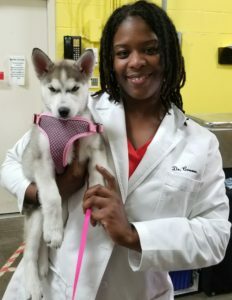 She is a veterinarian and served four years in the Army Veterinary Corps after receiving her Bachelor’s from Xavier University and medical degree from Tuskegee School of Veterinary Medicine. Turnera has worked in various subspecialties of veterinary medicine and is now focused on veterinary entrepreneurship. She makes veterinary services in Southwest Michigan more accessible by providing in-home preventative care with a holistic focus. Buddy-to-Buddy is proud to have Turnera as a volunteer!